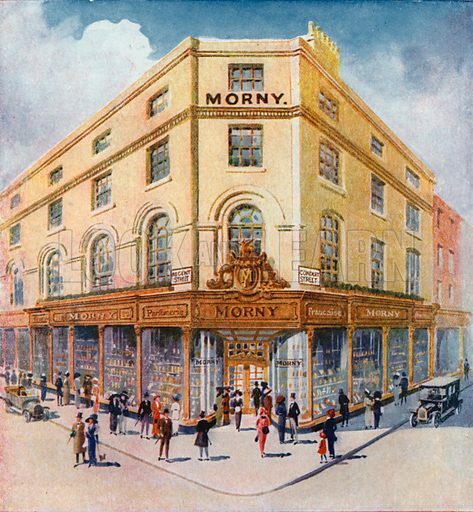 Morny Freres was an elegant pharmacy and parfumier which was originally called Morny, a grand and airy French-sounding name which was actually the nickname for a racehorse called Mornington. From Morny in New Bond Street, the shop moved to Regent Street and traded under the fake aristocratic name de Morny, which in 1918 was changed yet again to Morny Freres, presumably to create an even grander Parisian impression. In fact it was founded by an English chemist called Sidney F. Goss who was interested in creating perfumes, and during its early years the fragrances were named after composers, musical composition titles and themes. In the Twenties its most popular perfume was Chaminade, so called as a tribute to the French female pianist and composer, Cecile Chaminade. Many more pictures of shops and buildings on Regent Street can be found at the Look and Learn picture library. Main entrance in the facade of Liberty department store, Great Marlborough Street, off Regent Street, London. 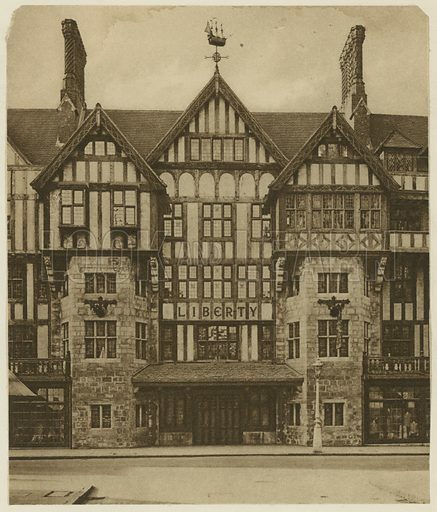 The Tudor building of the Liberty department store was built while the substantial premises on Regent Street were being renovated. It allowed the firm to continue trading, and the magnificent wing was completed in 1924 when the fashion for neo-Tudor architecture was at its height. The architects were father and son Edwin T. and Edwin S. Hall, who designed the long structure around three light wells, serving as large landings off which lay several smaller rooms, not unlike the layout of a country house. Arthur Liberty wished to replicate the experience of domestic comfort for shoppers visiting the store, and scale was an important tool in achieving this effect. The timbers used in this unique half-timbered building came from two ships, HMS Impregnable and HMS Hindustan. Indeed, the length of the shop frontage on Great Marlborough Street is exactly that of the Hindustan. 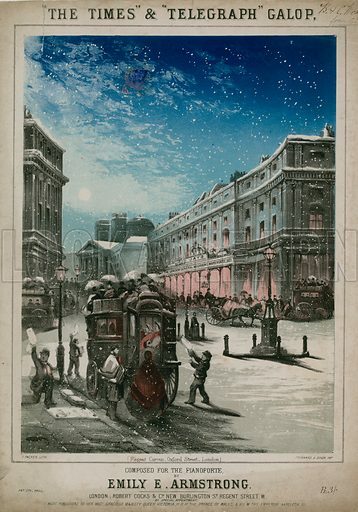 Many other pictures relating to London department stores can be found at the Look and Learn picture library. Jay’s London General Mourning Warehouse opened in 1841 and quickly established itself as one of the principal shops for mourning attire. It was especially noted for its black silk full mourning, though half mourning was also popular and became increasingly the norm. In providing dress and accessories for funerals and longer periods of mourning, it was careful to offer goods in a wide price range so as to attract the lower middle classes as well as the wealthier Londoners. The firm’s buyers travelled every year to the silk marts of Europe to buy black silk at the most reasonable price. As mourning conventions changed, so did the shop, and by the end of the nineteenth century it was also selling ordinary clothing in sombre colours appropriate to work as well as sad occasions. Prolonged periods of mourning became restricted to royalty and the aristocracy, and the custom of sending flowers to funerals grew enormously among the middle classes, whose busy working lives no longer permitted lengthy funerary formalities. The shop can be seen on the right in this music sheet from the late Victorian period, showing newspaper sellers in the foreground waving The Telegraph and The Times at passengers on an omnibus. Many more pictures relating to London department stores can be found at the Look and Learn picture library. This edited article about the Royal Navy originally appeared in Look and Learn issue number 356 published on 9 November 1968. After the defeat of the French fleet in Aboukir Bay in 1798, Napoleon directed his thoughts of conquest farther east. Britain, at the time, was more than ever anxious about the safety of her Indian Empire, and to protect it she entered into an alliance with Turkey. 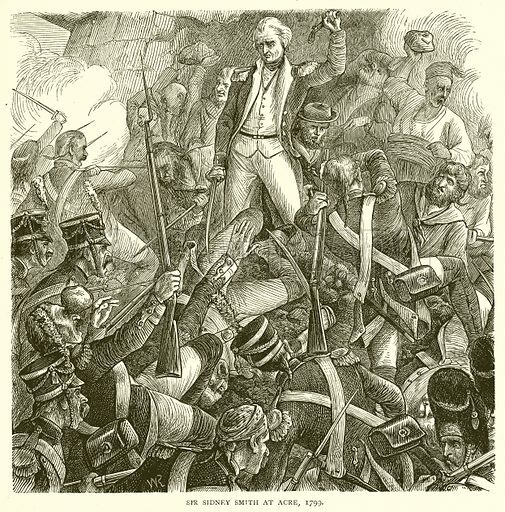 Under the provisions of this alliance a Turkish army was to traverse Asia Minor, in order to threaten the French Army’s rear, while advancing towards British India. Napoleon, hearing of the arrangement, determined to forestall the British plan and marched with an army of 13,000 men against St. Jean d’Acre, the appointed rendezvous of the Turkish forces. To assist the Turks defend Acre, a British naval force, under the command of Sir Sidney Smith, sailed from Constantinople and anchored at Acre on 15th March, 1799. Sir Sidney was sadly disappointed to find the fortifications of Acre in a ruinous and dilapidated condition, and almost destitute of artillery. To most men, the place would have appeared incapable of defence, but not to Sir Sidney. He gave instructions for the Turkish garrison to strengthen the fortifications, and, while this work was being carried out, he set sail with some ships’ boats to intercept the French naval forces. The ships’ boats succeeded in overtaking Napoleon’s flotilla, and captured the enemy’s battering cannon and ammunition. This material was used by Sir Sidney to fortify the town against the French. After this setback, Napoleon obtained fresh guns and opened the siege. He was determined to succeed, if at all possible. “On this little town,” he is reputed to have said to one of his generals, “depends the fate of the East. Behold the key of Constantinople, or of India!” But Sir Sidney Smith was to cause him to “miss his destiny”, which, Napoleon believed, included the subjugation of India. Shortly after the opening of the siege, Sir Sidney’s naval force was driven off by the equinoctial gales. Seven weeks elapsed before it could return, and during this time the French made nine attempts to storm the town. Each time, they were repulsed with immense slaughter. On 7th May, Sir Sidney’s ships returned, and every available man was got ashore to help defend the town. On 21st May, realising they were fighting against superior odds, the French decided to raise the siege and retreat. This edited article about Zimbabwe originally appeared in Look and Learn issue number 356 published on 9 November 1968. Carl Mauch wiped the sweat off his forehead and peered past his native guide. Below him stretched the plains . . . and five miles away, in a haze of heat, there towered a bare-flanked, green-topped hill, shimmering faintly in the African sun. Around its summit it wore, like a crown, a rampart built of stone. His guide, a local Karanga tribesman, was unimpressed. The hill on which they were standing, he argued, was the one of interest. Here could be found a pot of great magic, the pot-that-moves-by-itself. What were old walls compared with such a marvel? What indeed? 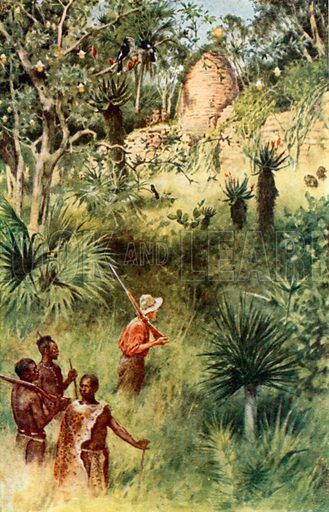 Mauch did not bother to explain that nowhere, in the vast African lands where Bantu natives roamed, was there evidence of buildings made from stone before the white man came. Why was Mauch searching for old stone ruins in that year of 1871? What brought him to that part of Africa that today is Rhodesia? He was a German geologist, born at Wurtemburg in 1837. He already had the discovery of two African goldfields to his credit when in 1867 he heard a story that seemed unbelievable. It came from a fellow-countryman and missionary, the Rev. A. Merensky. 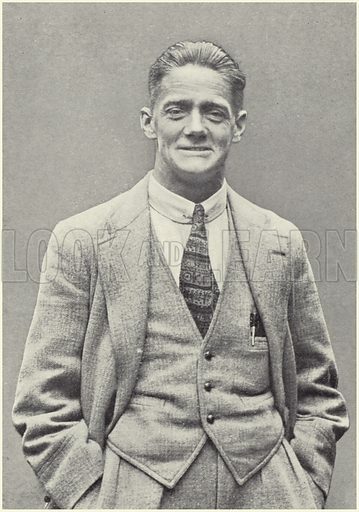 This edited article about William Morris, later Lord Nuffield originally appeared in Look and Learn issue number 356 published on 9 November 1968. William Richard Morris, 1st Viscount Nuffield, British motor manufacturer and philanthropist. Frederick Morris put down his newspaper and stared at his son in amazement and dismay. Mr. Morris didn’t add, as he could have done, that the family was poor, and that despite the facade of respectability every penny counted. But young William Morris, who had hoped to become a surgeon and had gone instead to work in a cycle workshop to oblige his father, explained it all. The shy and confident way in which he said this dispelled his father’s worry and surprise. Frederick Morris liked the lad’s quiet confidence. He admired the self-discipline by which young William had denied himself every pleasure in order to save from his meagre earnings. He knew the lad worked hard, and that when he was at Church School in Cowley he had proved himself mechanically minded, always tinkering with machines. “All right, my boy, you’ve got my blessing,” he said, and settled once more to his pipe and the evening paper. After all, hadn’t he chanced his arm earlier in life, in Canada and America, taking the mail by stage coach through territory riddled with Red Indians? And so, at seventeen, William Morris started making bicycles in an old shed. He had just enough money to buy a few simple tools, and the bicycles he made were so sound and good that his business was a success from the start. Soon he had a bigger demand for them than he could satisfy in so small a workshop, and he moved to larger premises in the High Street. This edited article about Tennyson the Poet Laureate originally appeared in Look and Learn issue number 356 published on 9 November 1968. Tennyson thereupon wrote two letters – one refusing the post, the other accepting it. Then he sat down to dinner with his family and guests while he made up his mind which one to send. In the end, he accepted. Alfred Tennyson, the fourth of a Lincolnshire parson’s 12 children, was then 41. He had constructed “an epic of 6,000 lines” by the time he was 12, and composed a drama in blank verse at the age of 14. By 1850, when he was 41, Tennyson’s reputation was secure not only in Britain but also on the Continent and in America. He had already published three collections of his poems. With Wordsworth, “Poet Laureate” was only a title. With Tennyson, it no longer fell short of its true meaning and purpose. 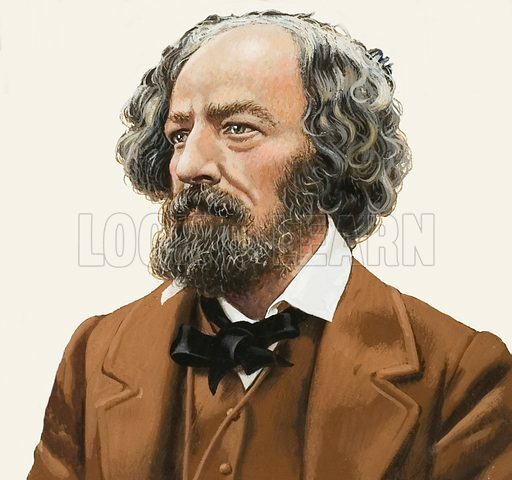 Tennyson was the first poet to be recognised by the man-in-the-street as the greatest living representative of a living branch of letters. Tennyson’s poems have a dignified, simple and sincere quality – he wrote on genuine impulse and not because he had to. His life spanned a long period. For the 40 years or so of his Laureateship (the Crimean War and the Indian Mutiny came in the first seven years) he wrote about scenes in English history, about the sea, the countryside and the people of this island kingdom. Tennyson became known as “The Poet of the People”, and he had the ability “to walk with kings, nor lose the common touch”. He became a personal friend of the Queen and in his later years she sought guidance and comfort from him. He hesitated a long while before accepting a title, but in the spring of 1884, and at the express wish of the Queen, he became Alfred, Lord Tennyson. He was by now the most famous poet in the world. When Tennyson died, on 6th October, 1892, the whole nation mourned. This edited article about Saints originally appeared in Look and Learn issue number 356 published on 9 November 1968. In the centuries between the time when the Romans left Britain (A.D. 410) and the Norman Conquest, Christianity flourished vigorously among the Celtic tribes of the North and West. The Welsh, Scots, Irish, Cornish, and even the Bretons of what is now a part of France, had more in common with one another than they had with the Angles, Saxons and Danes, who invaded them at various times, and who at first were without any religion other than worship of the old Norse pagan gods. Today, the various Celtic languages such as Breton, Welsh and Gaelic have much in common. In the Dark Ages, they were practically the same language. The peoples of the countries where these languages were spoken felt that they all belonged to the same family and kept in close touch with one another. Members of the monasteries in the Celtic countries paid regular visits to one another also, and it was quite common to find Welshmen in Brittany, or Irishmen in Scotland. It is, therefore, not surprising to learn that a saint commemorated on 15th November spent most of his life in France, although he was born in a Welsh valley and was brought up under the care of an Irish monk! Known officially by his Latin name, Machutus, he is more widely known as Saint Malo. A town on the French coast is called after him because he lived for many years on a little island nearby, called Aleth. Born in about A.D. 600, Machutus (or Malo) was baptised and educated at a Celtic monastery in the Welsh valley of Llan Carvan. Because there was a risk of even this remote spot being invaded by the Danes, he was sent to Brittany, and there settled on Aleth, being eventually made bishop of the part of the mainland around the modern town of St. Malo. Even there, he was not left in peace, and, when persecution of the Church broke out, he had to flee for his life to a different part of France, returning to his chosen home only in old age. According to one account, Saint Malo accompanied another Celtic bishop, Saint Brendan, on an adventurous missionary voyage to the Hebrides and the Orkney Islands, in the course of which they visited the famous monastery of Iona, founded about a century earlier by another Celtic saint, called Columba (A.D. 563). Saint Malo’s life and travels are vital evidence of the important part Christianity played in the lives of these Celtic people during the Dark Ages. They also show how Christian art and culture were kept alive in times when, in the rest of Britain, Christianity often seemed likely to be blotted out by heathen invaders such as the Norsemen and the Danes. This edited article about the Texas Rangers originally appeared in Look and Learn issue number 356 published on 9 November 1968. The two Texas Rangers rode up to the bank of the Rio Grande river. On the far side, a hundred yards away, was Mexico. And a mile or two beyond the border, a Mexican, wanted for a murder on United States territory, was serving in a store in the little town of Zaragoza. No American lawman could legally touch the Mexican – or claim the 500-dollar reward for bringing him in. The Mexicans, who were not overfond of Americans, preferred harbouring murderers to letting Rangers or Marshals across the border. So – the only way to get him out was to kidnap him! Sergeant James Gillett, one of the two Rangers, had a particular interest in seeing justice done. The killing had happened the previous Christmas. A popular editor had been shot down by two Mexican brothers, Abran and Enofre Baca, after a church social. Abran had hidden in the house of an uncle, who happened to be a United States judge! Gillett caught him there and collected a 500-dollar reward – after being offered twice as much by the judge to let his nephew go. Enofre had disappeared. A month passed without news of the wanted man’s whereabouts. 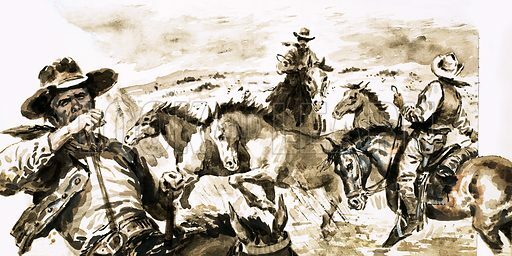 Then a friend of Gillett’s spotted Enofre in Zaragoza, and rode back to break the news that the murderer was out of reach on Mexican territory. But Gillett was not going to let a little matter of geography thwart him. This edited article about the Royal Navy originally appeared in Look and Learn issue number 355 published on 2 November 1968. As a step towards the French conquest of Britain, Napoleon Bonaparte planned to drive the British from their possessions in Malta and Egypt. On May 19, 1798, he set out with a large French fleet, succeeded in capturing Malta, and then sailed for Egypt. News of this reached Britain, and on June 12, Admiral Nelson was given command of a force of 13 seventy-fours and one 50-gun ship, with orders to “take, sink or destroy” the French fleet wherever he should find it. The chase lasted for several weeks, because Nelson had no frigates to scout for him. At last, on August 1, he spotted the French fleet of 17 ships (including 13 ships of the line) anchored in a broken line in Aboukir Bay, an open roadstead about 15 miles east of the Egyptian city of Alexandria. Between them and the shore were hazardous shoals, rocks and a long sandbank. Because an attack was not expected from that direction, the French guns on the landward side had not been prepared for action. Nelson realised this and ordered his ships to sail between the French and the shore and attack from that side. The Battle of the Nile began at sunset, and as darkness was falling, five British ships raked the French line with terrific fire. 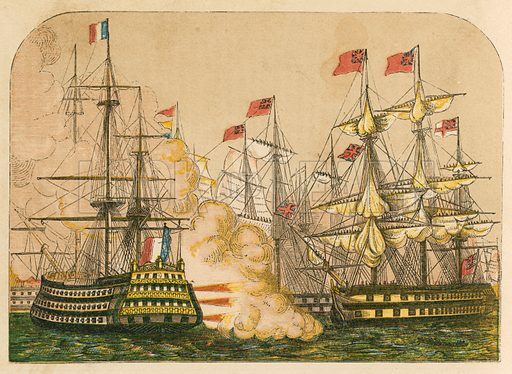 Nelson in the sixth ship, the Vanguard, met furious fire from Spartiate and Aquilon. He was without his right eye, lost at the siege of Calvi in 1794, and his right arm, shot away at the siege of Santa Cruz in 1797. In the present battle, while standing on his quarter-deck, he was deeply wounded in the forehead by a fragment of iron shot which blinded him temporarily. He was taken below for treatment, but hardly had his head been bound up when he was on deck again. By this time – nine o’clock – the three-decker French flag ship Orient was on fire. The flames spread rapidly and soon her rigging was a mass of fire, with flames leaping up in mast-high sheets from one end of her to the other. Shortly after ten o’clock, the great ship blew up with a tremendous explosion. Seventy of her crew were saved, most of them by British boats. By morning, the entire French fleet had been sunk or captured, with the exception of two rear-battleships and two frigates which were taken or destroyed in subsequent actions. On the British side, not a vessel was lost, although all were damaged to some extent.